Asakusa Shrine, also known as Sanja-sama ("Shrine of the Three gods"), is one of the most famous Shinto shrines in Tokyo, Japan. 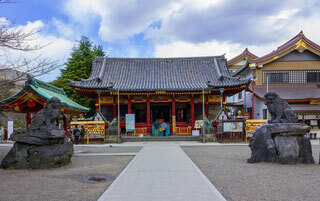 Located in Asakusa, the shrine honors the three men who founded the Senso-ji. Asakusa Shrine is part of a larger grouping of sacred buildings in the area. It can be found on the east side of the Senso-ji down a street marked by a large stone torii. This article uses material from the Wikipedia article "Asakusa Shrine", which is released under the Creative Commons Attribution-Share-Alike 3.0 License.